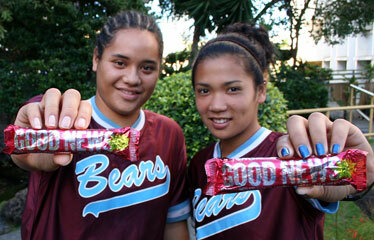 Sanoe Kekahuna, left, and Nicole Alconcel were two of the reasons Baldwin won the state girls softball championships this past season. The consensus is rarely this decisive, but the top honors in the Star-Bulletin 2007 All-State softball selections are clearly maroon and blue. Nicole Alconcel and Sanoe Kekahuna, the batterymates who carried the Baldwin Bears to the state crown, were honored as Pitcher of the Year and Position Player of the Year by media and coaches. They were joined on the first team by teammate June Ann Lusk. Mililani and St. Francis each have three players on the first team, as well. Alconcel and Kekahuna, though, were the brightest stars in the state. "They truly deserve it. They definitely had the best pitcher and catcher," said St. Francis coach Mark Glushenko, whose team lost to Baldwin in the state tournament semifinals. "Dengue (Alconcel) was awesome. She did everything at states for them. She shut us and Mililani out. You couldn't ask for anything better for them." Alconcel's numbers were unmatched in the Maui Interscholastic League with a 13-0 record and 0.25 earned-run average. She hurled 12 shutouts and threw two no-hitters while striking out 97 with only 22 walks. In the state tourney, Alconcel allowed just one run in 21 innings, including shutouts of powerful St. Francis and Mililani. She posted a 3-0 record with an 0.43 ERA, 25 strikeouts and just five hits and eight walks. Alconcel was also astonishing at the plate. She hit a clutch two-run homer in a 2-0 semifinal win over St. Francis, then stroked another two-run round-tripper in the title game win over Mililani. Alconcel hit .424 at the plate in MIL play with two homers, 16 RBIs and 14 runs scored. Her success on the mound was due in large part to Kekahuna, who called every pitch. The powerful senior hit .688 in MIL play with four home runs, five doubles, 20 RBIs and 18 runs. She got into the best physical shape of her life, working with a personal trainer after her junior season. 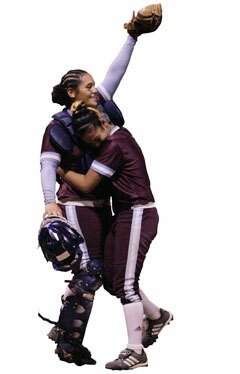 "She's really a force behind the plate," Mililani coach Rose Antonio said of the Cal-bound catcher. "She gets a lot of respect from all the teams. She blocks well, calls all the pitches and she's a student of the game." Baldwin's Rudy Souza was also a unanimous pick as Coach of the Year, capping a career that spanned four decades at the helm. Souza and son Ryan, who was head coach for the past five years, shared responsibilities this season. The elder Souza had stepped down after health problems surfaced in 2001, but came to the rescue before the season when Ryan and his wife faced a personal tragedy. With Rudy Souza's return and Ryan's continued contribution, the senior-laden team reached its peak. He came to the state tourney despite a case of walking pneumonia. Coaches around the state feted father and son. "Ryan and Rudy deserve it. They've been doing it a long time. Ryan-boy, he's so good with kids. Anybody who wants instruction or advice, he'll help them," Glushenko said. "He worked with some of our kids in the offseason." Ryan Souza, who diligently worked with his current seniors since they were seventh-grade team managers, was not surprised by his ace. "Competing over the summer (on the mainland) is what got her to the next level. She's a great kid with great work ethic and a great personality. Seeing her work hard, it paid off. It makes you feel good. Kekahuna, meanwhile, drew a simple, rave review from Rudy Souza. "She's the best catcher I ever had," he said. Mililani's top players -- pitcher Makani Duhaylonsod, shortstop Courtney Senas and second baseman Kristi Oshiro -- were clear first-team choices. Duhaylonsod was 14-3 with a 1.25 ERA in Oahu Interscholastic Association play, then pitched her Trojans into the state final. Senas and Oshiro are both freshmen. St. Francis' big three of third baseman Sasha Koki, ace Brittney Akana and first baseman Shannon Lum anchored the best team in school history. Koki was a marvel at the hot corner, also pitched, played second base and hit .483 in ILH play. Lum, a pure power hitter, socked six homers and had an on-base percentage of .641. She was 13-0 with an 0.25 ERA In the MIL, with 12 shutouts, 97 strikeouts and just 22 walks. In the state tourney, she was 3-0 with a 0.43 ERA, 25 strikeouts, eight walks and five hits allowed in 21 innings. She also delivered at the plate, socking a two-run homer in the semifinals and another two-run bash in the title win over Mililani. The 5-foot-11 righty was 14-3 in OIA play with a 1.25 ERA, 70 strikeouts and 15 walks in 106 innings pitched. She was superb at the plate, as well, with a .410 average, five home runs, 11 RBIs and eight runs scored in OIA action. She has a chance to be the premier pitcher in the state next season. Despite a shoulder injury, she went 13-4 in the ILH with a 1.63 ERA and 59 strikeouts. "She only sat out one game even though she lost a little velocity on her drop ball," coach Mark Glushenko said of his tough ace. "It wasn't until late in the season that she got it back." Akana will likely play at Western Oregon next season. Belted six homers, three triples and five doubles despite a steady diet of walks (24). Batted .387 with an OBP of .641. "Last year, she had three walk-off hits. Two of them were homers," coach Mark Glushenko said. "So nobody wanted to pitch to her. They'd pitch around her if nobody was on. It was sort of frustrating for her." Batted .440 in OIA play along with a .556 OBP. Had 10 doubles, 11 RBIs, eight walks and scored 16 runs. Oshiro teamed with another freshman, Courtney Senas, to form one of the best young middle-infield combinations in recent history. The two-sport standout hit .537, with a slugging percentage of 1.002. She drove in 17 runs, hit two homers, five triples and four doubles. Her performance is even more intriguing because she recently won her fourth straight state wrestling title. Nohara will suit up for the UH-Hilo softball team next spring. Hit .688 in the MIL with four homers, five doubles, 20 RBIs and 18 runs scored. The slugger also walked 11 times. Rudy Souza calls her the best catcher in Baldwin history. Ryan Souza said Kekahuna paid the price. "She dropped playing other sports for softball. Everything she's gotten, she's worked for. She made the biggest jump in athletic talent." Her outstanding play wowed coaches near and far. Senas hit .540 in OIA play with two homers and 15 RBIs. Her speed (19 runs) and power (two homers, three triples, seven doubles) were unmatched. "That girl is an animal out there. I knew when she came to the high-school year, she'd be a phenomenal athlete," Kapolei coach Tony Saffrey said. Batted .411 (30-for-73) in OIA action with 10 doubles, a triple and three homers. She had 15 RBIs. "Brittney loves the game. As a freshman, she spent most of her time as a flex player in the outfield with minimal time at the plate," Sabers coach David Perreira said. "Her hard work in the offseason both in the cages and the weight room helped her to stand out." Hit .554 with a slugging percentage of .943. Drove in 16 runs, stole eight bases. Amassed 36 base hits, including 12 doubles and three triples. Scored 20 runs. "She's gotta be one of the best in the state. The arm, the field sense, the speed. Her read off the bat, the first step is there," coach Tony Saffrey said. The speedy Lusk batted .472, stole seven bases and scored 12 runs in MIL play. Lusk has been one of the top track athletes in the state for a few years. Her defensive prowess helped anchor a squad that backed up Alconcel in two shutout wins at the state tourney. She will run track at the U.S. Naval Academy in the fall. Excelled at third base, while also playing second and pitching. Hit .483 in the ILH with an OBP of .691. Smacked three homers, three triples and eight doubles. "She kind of saved us a couple of times, like against Kamehameha, with her diving plays at third," coach Mark Glushenko said. The father of Baldwin softball capped his 30-year career by returning to the dugout to lead the Bears to their first state title since 2001. Coaching honors aren't his favorite subject. "Well, that's their opinion," Souza said of his peers' choice. With son Ryan's hand on the steering wheel, the elder Souza, 73, led Baldwin to a 17-0 record. Kiane Dalit, Sacred Hearts, Jr.
Jandee Taira, St. Francis, Sr.
Joslyn Eugenio, Sacred Hearts, So.